I have been a fan of Hallie Ephron’s writing since I first read her novel Never Tell a Lie in 2009, so I am thrilled to feature her here today on BOLO Books talking about the new edition of her excellent non-fiction craft book on writing and selling in the mystery genre. As a reviewer, I find that reading books about the writing craft help me to better understand the art of fiction and help me to hone my critiquing skills. Hopefully that newfound knowledge reflects itself in my reviews. Robert B. Parker used to claim that this was his least favorite question: Where do you get your ideas? His flippant response: At the supermarket. Turns out, for me at least, that’s not far off. And actually, my favorite question to answer (and hear how other authors answer) is where did that story come from? Because nine times out of ten, the answer is unexpected and fascinating. The idea for my first suspense novel came to me at a yard sale. It was at a Victorian house with gingerbread-trimmed gables and leaded glass windows. I was peppering the homeowner (a complete stranger) with questions about their recent renovations and (probably to shut me up) she asked me if I wanted to go inside the house and have a look around. Of course I did. I was wandering through the house when I thought, Suppose a woman goes to a yard sale. What if somehow she manages to talk her way into the house? And what if she never comes out? I ran home and started writing. The book, Never Tell a Lie, starts with a yard sale at a Victorian house and ended up being a finalist for the Mary Higgins Clark Award. It was also made into a movie for the Lifetime Movie Network. One of the reasons it took me so long to start writing fiction was the fear that I didn’t have anything to write about. Thank goodness, it turns out intriguing ideas are all around you. Yes, in the supermarket. At yard sales. That quotidian detail that intrigues one author won’t intrigue another. I’ve learned to tune in and pay attention when my brain perks up and says, Oh, that’s interesting. For my new suspense novel, You’ll Never Know, Dear (June 2017, Wm. Morrow), that moment came when a friend told me about how she’d helped her aging mother clear out her home. Her mother had been a dollmaker, and under every bed she found boxes and boxes of doll parts. Legs. Arms. Torsos. Eyeballs. Creepy, right? From there I started to ask myself; What if? 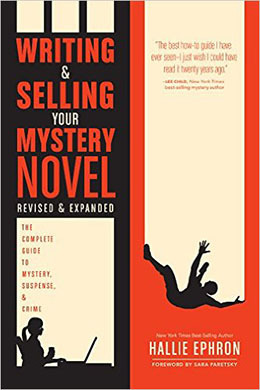 There’s much more about finding ideas, formulating a premise, and the legal risks of using real events and people, in the my Writing & Selling Your Mystery Novel: Revised & Expanded. I revised and expanded it to include what I’ve learned since the book was first published and nominated for Edgar and Anthony awards twelve years ago. Read a preview now. Transform your killer idea into a published book with Writing and Selling Your Mystery Novel Revised and Expanded, available now from Writer’s Digest Books. Hallie Ephron is the New York Times best-selling author of suspense and mystery novels. Her novels have been called “deliciously creepy” (Publishers Weekly), “gripping” (The Boston Globe), and “snaky and unsettling” (Seattle Times). She is a four-time finalist for the Mary Higgins Clark Award, recognizing excellence in suspense. Her novel Never Tell a Lie was turned into a movie for the Lifetime Movie Network. She wrote an On Crime book review column for The Boston Globe for more than ten years and won the Ellen Nehr Award for Excellence in Mystery Reviewing. The first edition of Writing and Selling Your Mystery Novel was an Edgar Award finalist. Hallie is a popular speaker and teaches writing at conferences nationally and internationally.